150 pages | 7 B/W Illus. Napoleon had a profound impact on the development of both France and Europe, and his career had repercussions across the wider world. His career had all the elements of a classical tragedy: having begun with spectacular military and civil achievements, it ended in exile on the tiny Atlantic island of St Helena. Almost two centuries after Napoleon’s death, historians continue to argue about his aims, his achievements and his legacy. 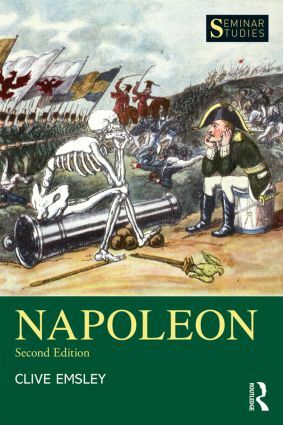 In this thoroughly revised and updated new edition, Clive Emsley brings these historiographical debates up-to-date, and broadens his study to include discussion of the cultural and social impact of the Napoleonic era. contains an expanded selection of primary source documents, ranging from state papers to police reports. A Chronology, Glossary and Who’s Who of key characters are also provided, making this an indispensable textbook for students of nineteenth-century French and European history. Clive Emsley is Professor Emeritus of History at the Open University. He is co-editor of the Seminar Studies series. Among his publications are The Longman Companion to Napoleonic Europe (1993) and Gendarmes and the State in Nineteenth-Century Europe (1999).